Too many people underestimate the importance of the rest cycle. A rest cycle exists not only in the physical part of training but also in the mental part as well. Physically, rest allows the body to heal and recover. Mentally, rest increases productivity, renews attention, increases memory and increases creativity. Spiritually, rest allows us to rediscover our identity and a sense of mission. Many people struggle to find enough time to fit riding in with the rest of life…but maybe we are over thinking this. 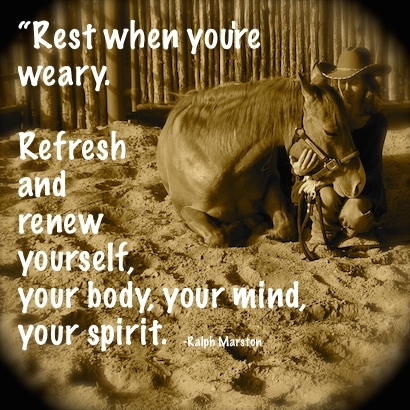 Work is good, but rest is important too and if you find yourself renewed and refreshed by spending time with your horse, even if it is something as simple as a good grooming session…maybe that will have a greater impact on the two of you than you might imagine. ← What silly things have you caught horses doing? So true! Horses are my career, and even though I love them, I only ride six days out of every seven. On the seventh day – usually Sunday – I just feed them and sit watching them or scratch their ears and tell them they’re loved. That’s my therapy. so applicable to ANY life and work. I sometimes feel guilty for not riding as much as I should, (fulltime job, last semester nursing school, and my live was pleasantly crazy before I added school). Yet I know in my heart my 3 horses are very well taken care of and riding them is the least of their and my needs. They have saved me many times over the past 3 years from myself, and gotten me out of depression even for just a couple of hours a day. They depend on me at least two times a day for water, food, and nurture. I won’t ever let them down. My horses are my daily therapy session. I have a demanding job and a teenager at home. Many days all I have time for is to turn them out for a bit while I clean their stalls. But often it’s the best part of the day!!!! There is always a hug from Rook, a backrub from Strider while he scratches his face on my back, a snuffly kiss from Louie who loves it when I blow air into his nostrils. It makes me take a deep breath and spend some time in the moment. And then I do my best thinking and problem solving while I shovel their poop….